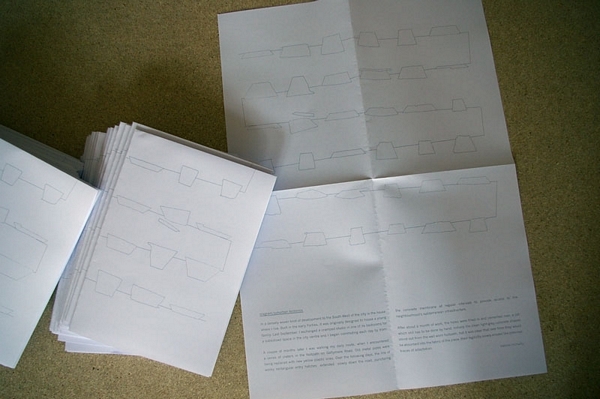 This text and image piece was produced as an A3 poster insert for Travelogue 1: Shadow Perimeters , a zine produced by Ciaran Walsh and Dominique Hurth. It was available in various places in Dublin and Berlin, and as a download from the Travelogue website. My accompanying text is reproduced below. In a densely woven knot of development to the South-West of the city sits the house where I live. Built in the early Forties, it was originally designed to house a young family. Last September, I exchanged a cramped studio in one of its bedrooms for a subsidised space in the city centre and began commuting each day by tram to work there. A couple of months later I was walking my daily route, when I encountered a series of craters in the footpath on Galtymore Road. Old metal water pipes were being replaced with new yellow plastic ones. Over the following days, the line of wonky rectangular entry hatches extended slowly down the road, puncturing the concrete membrane at regular intervals to provide access to the neighbourhood's subterranean infrastructure. After about a month of work, the holes were filled in and concreted over, a job which still has to be done by hand. Initially the clean light-grey concrete shapes stood out from the well worn footpath, but it was clear that over time they would be absorbed into the fabric of the place, their legibility slowly eroded like previous traces of adaptation.